Brad point drill bits are the best choice for drilling wood and these drill bits are perfect for drilling pen blanks. High Speed Steel for accuracy and sharpness, and feature extra long center point. The center point is actually a continuation of the flutes and bores rather than being pushed through the work piece. 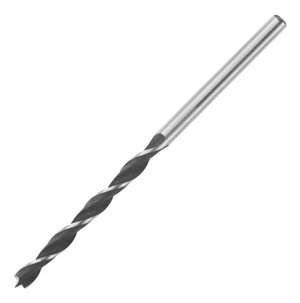 This 5mm high-speed steel drill bit replaces the bit that comes with the 5mm Kreg Shelf Pin Jig. Also works with the 1/4" (6mm) Kreg Shelf Pin Jig. This high-speed steel drill bit allows you to drill 5mm shelf-pin holes with the Kreg Shelf Pin Jig. This bit features an ultra-sharp brad-point tip for exact centering and clean cutting, so that you'll get smooth holes for shelf pins. The 1/4" hex shank tightens easily into standard drill chucks, and fits quick-change chucks and adapters. 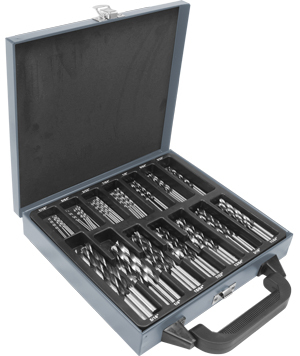 The ideal drill bit set for woodworkers. 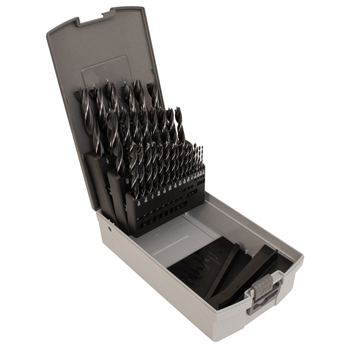 High carbon steel brad point bits, conveniently indexed in in fractional inches and stored in solid storage case. • 1/16" • 3/16" • 5/16" • 7/16"
• 5/64" • 13/64" • 21/64" • 29/64"
• 3/32" • 7/32" • 11/32" • 15/32"
• 7/64" • 15/64" • 23/64" • 31/64"
• 1/8" • 1/4" • 3/8" • 1/2"
• 9/64" • 17/64" • 25/64"
• 5/32" • 9/32" • 13/32"
• 11/64" • 19/64" • 27/64"
This 100-piece drill bit set includes six to ten each of 14 sizes ranging from 1/16" to 5/16". A metal storage case with an insert to organize bits by size is included. 1⁄16", 5⁄64", 3⁄32" and 7⁄64"
1⁄8", 9⁄64", 5⁄32", 11⁄64", 3⁄16", 13⁄64", 7⁄32", 15⁄64", 1⁄4" & 5/16"
3 high carbon steel brad-point bits each of sizes: 1⁄8", 9⁄64", 5⁄32", 11⁄64", 3⁄16"
3 high carbon steel brad-point bits each of sizes: 13⁄64", 7⁄32", 15⁄64", 1⁄4" and 5/16"
Hinged steel case with latch and convenient carry handle; Molded insert with size labels to keep bits organized. 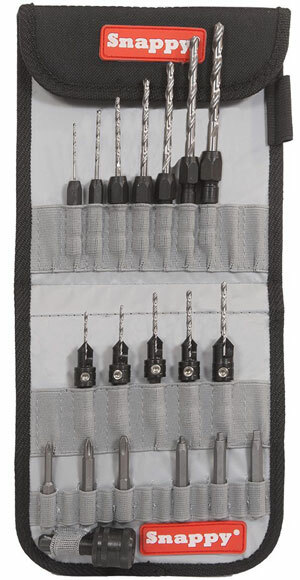 This set includes 10 each of the most commonly used smaller sized drill bits. The bits in this set are all split point centers. Using a 1/4" hex quick-change system allows you to easily exchange between drill bits and screwdriver bits by avoiding the hassle of always having to adjust your drill chuck. Just place the quick-change chuck in your drill chuck and your ready to go. The quick-change chuck excepts all types of 1/4" hex shank bits. Just push the bits in until you hear the snap and slide the sleeve back to remove them. 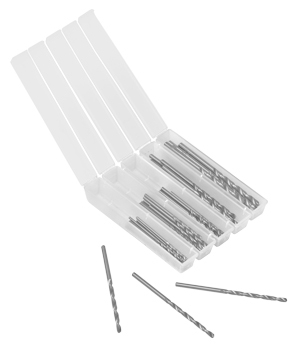 Because of the convenience of this type of system more and more drilling accessories are being manufactured with 1/4" hex shanks.This is a great start up set for converting standard drill bits to hex power bits. 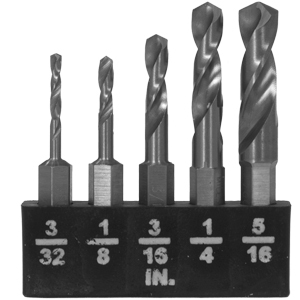 Drill bits can be changed with any style round bit of approximate style. Colbolt, Carbide, Brad Point, ect. Made in USA by Snappy. Handy canvas pouch to keep all your quick change tools together. Made in USA by Snappy. 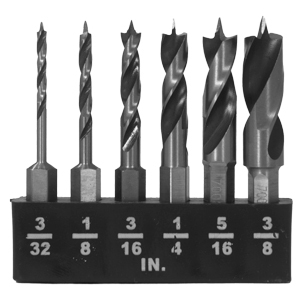 Our 7 Piece Brad Point Drill Bits are tooled out of high speed steel for durability and extra long life. This starter set contains the most popular sizes for doweling. With the Milescraft Wood StubbyBit Set, now you can drill holes into wood, in hard to reach areas you couldn’t get to before without breaking off the tip of a good drill bit. 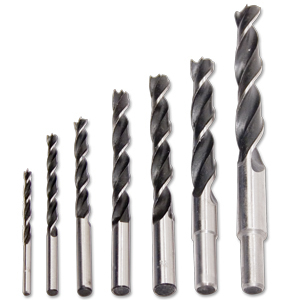 These durable drill bits are precision ground from one piece of M2 High-Speed Steel; there is no weak spot where two pieces are welded or crimped together. With a standard 135° tip, these bits are ideal for drilling into wood. 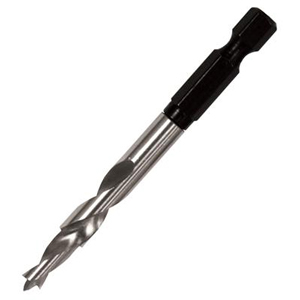 With an overall length of 1-7/8″ (47.5mm), these StubbyBits let you drill in confined spaces and around tight corners. The 1/4″ hex shank fits standard and quick-change chucks. With the Milescraft 5 Pc. Metal StubbyBit Set, now you can drill holes into metal and other surfaces in hard to reach areas you couldn’t get to before without breaking off the tip of a good drill bit. 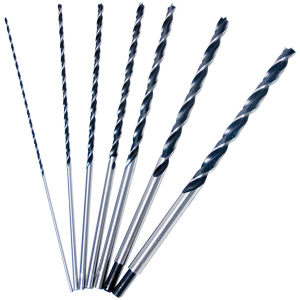 These durable drill bits are precision ground from one piece of M2 High-Speed Steel; there is no weak spot where two pieces are welded or crimped together. With a standard 135° tip, these bits are ideal for drilling into metal, plastic, or other materials. Ranging in length from 1-1/2″ (36.5mm) to 1-3/4″ (42mm) overall length, StubbyBits let you drill in confined spaces and around tight corners. The 1/4″ hex shank fits standard and quick-change chucks.